I’m continuing using up my supplement samples I’ve collected over the past year or so ordering my supplements online, and I’ve got another pre workout supplement review. This review is going be on Betancourt Nutrition’s pre workout “D-Stunner”. It will just be a mini review, and then I will give my workout updates below the analysis. 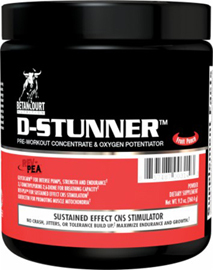 D Stunner is a pre workout supplement that prides itself on providing energy and focus without the crash or any jitters. D Stunner is DMAA free so you won’t experience the DMAA crash that you might with other pre workouts that contain that stimulant. Besides the crash free energy and focus, D Stunner also enhances nitric oxide production for muscle pumps, supports breathing capacity and oxygen uptake for enhanced performance, and increases muscular strength and endurance. Amongst the “D-Stunner Performance Blend” is Beta Alanine and Creatine Monohydrate which are two main ingredients that will help with the strength and power increases as well as the muscle endurance. How Did I like D Stunner? First off I did get a great energy boost taking this supplement 30 minutes before my workout. And as promised the boost came without jitters during my workout or a crash afterwards. I had a great workout today, and feel like D Stunner may have helped me through a few extra reps within my workout. Today I had a tough back and shoulder workout and I ended up lifting more weight for more reps than I expected myself to. After my workout I had a cardio session and that went really well too. I felt like I still had quite a bit of energy after my weight lifting to get in a good cardio workout. I’ve maybe felt bigger pumps with other pre-workout supplements, but I still feel like I got a pretty good pump with D Stunner. I had the Fruit Punch flavor and I found it really good tasting. As far as taste it would probably get a 9/10. It also mixed well in a shaker bottle if you’re interested in that. Overall for performance and taste I would give D Stunner a 9 out of 10 for review purposes. It was definitely a good product that made my short list. What is the Price of D Stunner? Online at BodyBuilding.com you can find D Stunner for almost $20 cheaper than in the supplement stores. 1 tub of 28 servings will cost you $29.99 or just over $1 per workout (assuming 1 scoop). 1 scoop was great for me and I think that should be enough for most people out there. That is a very fair price for a solid pre workout, and I recommend giving it a shot. You will also get a 10% discount if you click here before buying and spend $50+ (just grab another supplement as well). I don’t have much to talk about today, as I got a post up last night. But I did get my workout in this morning. Today was back and shoulders focusing on a mix of strength and hypertrophy. I started off with a single arm lat pull down cable machine for a warm up, followed by wide grip pulls up, and then 1 arm cable rows. I then moved onto a few shoulder exercises with single arm standing DB shoulder press and DB lateral raises. I finished the workout off with straight arm lat pull down press downs, cable lat raises superset with bent-over cable raises, and then a finished of 45 lb plate front raises. It was a tough workout. I kept the rest between 60-90 seconds for each exercise and performed anywhere from 2-4 sets of each with reps between 8-12, and then 25 timed reps for the finisher. After the weights I hit up the stair master for the cardio and increased the intensity from yesterday’s cardio workout just a little bit. I’m going to try and increase the intensity each time I do my cardio workout. Tomorrow I’m going to be going for an earlier workout and then I’m heading to Toronto for the night for an NHL game (Leafs vs Penguins). It will be a half cheat day. I’m going to try and keep the eating not too bad, but I will be having some beers. I just need to make sure I don’t have too many beers so I can get a good workout in on Friday. Because of the mid week break from my routine I probably won’t be doing much this weekend. Anyways have a good couple of days and work hard! Great site – I would like to know it its okay to take multiple supplements per day. For example – would you recommend Animal cuts and this product and a testoserone product at the same time. Not sure if that would be okay. Thanks Angelo. It would depend on the supplement, and you may want to check with a doctor first but I have used a testosteron and fat burner product at the same time in the past. I recommend choosing one goal – lose fat or gain muscle. If you try to do both you will see mediocre results most likely, which is why I don’t really recommend using a test booster and a fat burner at the same time.